GBPUSD is affected by England economic data such as Average Earnings including Bonus, Unemployment rate and Claimant Count Change. After GBPUSD growth yesterday there was a pullback this morning but it turned into a bullish trend again. The pair is finding support at 1.45530 with resistance at 1.45990 which both lines are above the weekly pivot point at 1.4383. The EMA of 10 is above the EMA of 50 indicating the price movement in higher ranges in the last recent days. The MACD indicator is in positive territory showing the price growth and the RSI is above the 50 level. 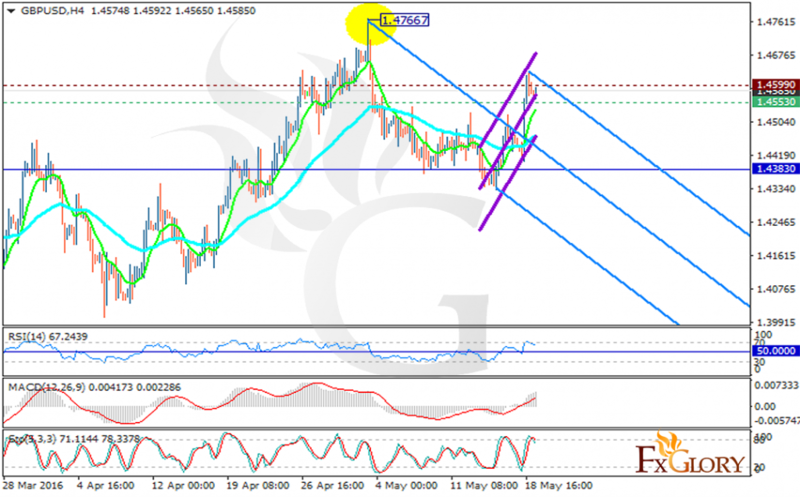 According to these indicators, the pair will climb up the ascendant channel creating a new high around the previous high area at 1.47667. However, the Stochastic is signaling a price fall suggesting the price movement along with Andrews’ pitchfork. The buy opportunity seems stronger than the sell therefore long positions are recommended with the target at 1.4760.